Sister Kirsten Leslie: I Try To Be Grateful In Any Circumstance, But This Week It Was Easy!! I Try To Be Grateful In Any Circumstance, But This Week It Was Easy!! This week was full of miracles!! It seems that all the hard work we have been doing for the last couple transfers has started to pay off! First things first: transfer calls. As you can tell by how I am emailing on Monday, I'm still here in Casper with Sister Woodbury!! We are so excited to stay together for this holiday season! We know there's a reason we are staying together and we are expecting miracles!! We are so pumped!!! It was very unexpected, because I was in Minot for 9 months, then here for 7 1/2 months, then my last area for 3. How weird! But hey, whatever works! The crazy part of transfers is the elders that we share the ward with both got transferred out and not replaced, so we are now the solo missionaries in the Casper 4th ward!! Our area just doubled, so we are going to be VERY busy, but we're excited! Now we have absolutely no excuse to not be finding people and teaching a whole bunch! So we're going to make it happen!! We talked to Jessica this week again!!! Well, we actually texted with her last night, and she was totally more open to us and she misses us! She moved, which was good to find out, but she still lives in our ward, which means we are destined to teach her! Haha or, that's how we're taking it. :) We invited her to the First Presidency Christmas Devotional on the 7th (which, by the way, you should ALL be watching that!!) and our ward Christmas party, which is going to be a night in Jerusalem, so it'll be super spiritual and awesome!! And she said she will for sure get one of those days off work so she can come to one of them!! We were SO excited to be able to see her again soon!! We've missed her a lot. We sent her one of our Halloween cards last month, and she said she put it up on her nightstand!! What a cutie!! So we are super pumped about that!! We met with Chris this week and got to talk to her about patriarchal blessings, and that really touched her. It was a really powerful lesson and she recognized that as something that she really wants and needs right now. SO yesterday she talked with Bishop and got the go ahead to receive her patriarchal blessing! We are so stoked for her! Well that's it, I think!! This week was amazing and we're super pumped for how awesome this one will be!! 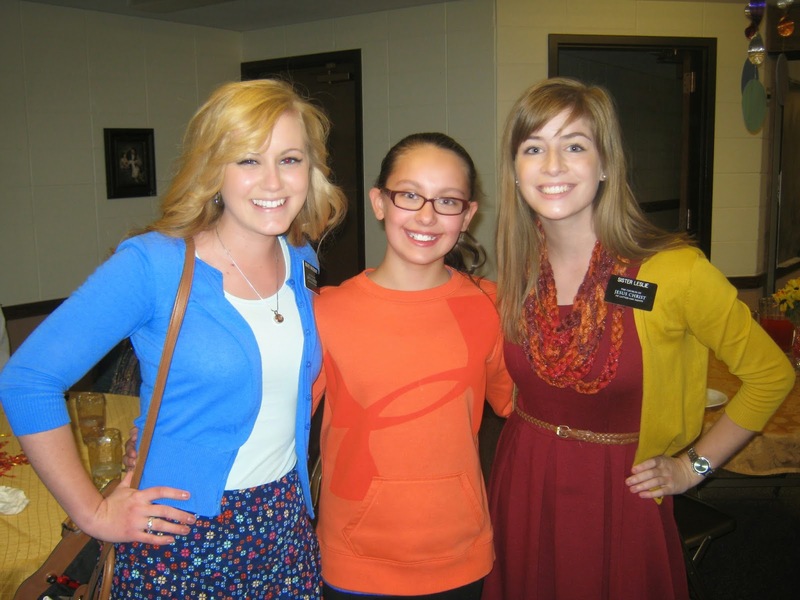 Sister Woodbury and I with Emily, the super cute 11 year old that invited us to her Activity Days party! Us and Elder Price and Elder Schneringer before they got transferred. We shared the ward with them. Elder Noble, Elder Edwards, Me and Sister Woodbury for the last time! Sister Mower and I on exchanges shoveling Deb's driveway!